6,000 of your neighbors trust us with their vision. Find out why. 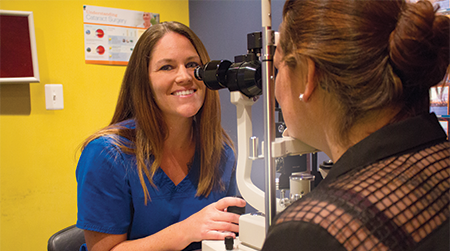 As part of our comprehensive medical evaluation, we will be happy to provide you with a referral to an optometrist or ophthalmologist who can fit you for glasses or contacts or provide Lasik services. Click here to download our Consultation Request form. A regional leader in the diagnosis and treatment of glaucoma and cataracts, we offer a wide range of advanced procedures to improve and preserve your vision. Should you require surgery, your comfort and well being are our top priority. From pre-op testing to post-op care, you can be assured you’re in expert hands. Click here for our online consultation request form. "I can see gauges on the car, distance and near, and am even able to read a magazine in dim light."